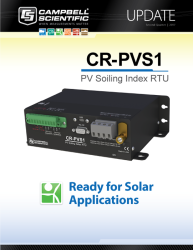 Campbell Scientific is excited to announce the CR-PVS1, a remote terminal unit (RTU) designed specifically for photovoltaic (PV) soiling-loss index applications. The PV soiling-loss index quantifies the loss of PV module power output due to accumulation of dirt or snow on the PV module surface. This information allows solar energy professionals to better evaluate and manage the impact of soiling on PV-plant performance. 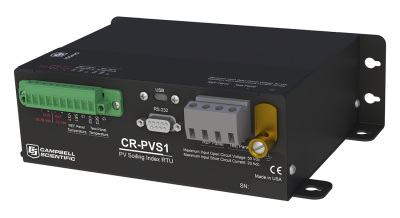 The CR-PVS1 can be the heart of an independent soiling measurement station or included as an add-on peripheral to any new or existing meteorological station. The RTU is preconfigured and field-ready for operation—the user only needs to update the station time. It is designed to primarily communicate via the Modbus RTU protocol. The CR-PVS1 calculates soiling-loss index by measuring short-circuit current and back-of-module temperature on a reference PV module, which is kept clean, and a test PV module, which is kept dirty. Two high-quality 110PV sensors are included with the CR-PVS1 for measuring back-of-PV module temperature. The reference and test PV modules can be user-supplied or ordered with the CR-PVS1 as an option. The CR-PVS1 continuously makes and stores measurements. However, soiling-loss index calculations are only performed under certain atmospheric characteristics, avoiding differences in soiling due to environmental instability, cloud influence, zenith angle of the sun, module-current dependence on irradiance level, and spectral effects. The CR-PVS1 calculates a quality factor to give the user some feedback on the number of qualified measurements that went into calculating the soiling-loss index.